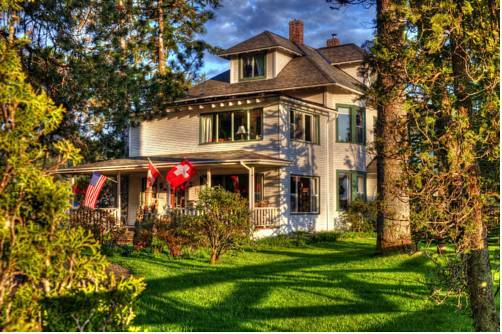 The Miller Tree Inn is a 1916 farm homestead bordered on two sides by pasture land, at the edge of small Forks, WA. The inn has 8 rooms, all with private bathrooms. Some rooms have gas fireplaces and jetted tubs. Our guests have use of a covered front porch, 2 common areas, TV DVD, piano and wireless internet. We are located near the Hoh Rain Forest and Pacific beaches and other wonders of Olympic National Park. We are also close to many rivers where guests can arrange for drift boat fishing trips, mostly in October - April, when we will do pre-dawn breakfasts for our angling guests. A full, hot breakfast is included in the room rates and is normally served between 7 30 and 9 00 AM. Check-in is at 4 00 PM. Guests planning to arrive before or after this time must contact the property at least 48 hours prior to arrival to receive special check-in instructions. As a bed and breakfast property, the Front Desk hours will vary guests should contact the property to find out more information. To contact the property, use the number on the reservation confirmation received after booking. Seattle-Tacoma International4 hour drive and ferry ride west from Seattle. 12 miles from Pacific Beaches and 40 from Hoh Rain Forest or Sol Duc River Valley. 1-2 miles to five different fishing rivers.